How perfect would the small table top ones be for fun succulent filled gifts??? Ace Hotel NY - More Type! So after doing the beach thing, i realized i really needed to sit down and do some work between all the running around i’ve been doing in NY! And i guess the Ace Hotel New York really must feel pretty homey, because i ended up calling up and booking a few nights there to nurse my sunburn and curl up with my laptop to catch up. Of course while here, as the soft opening evolves, i noticed even more awesome typographic details (i also didn’t have a chance to show you other rooms i poked around in last time as well!). 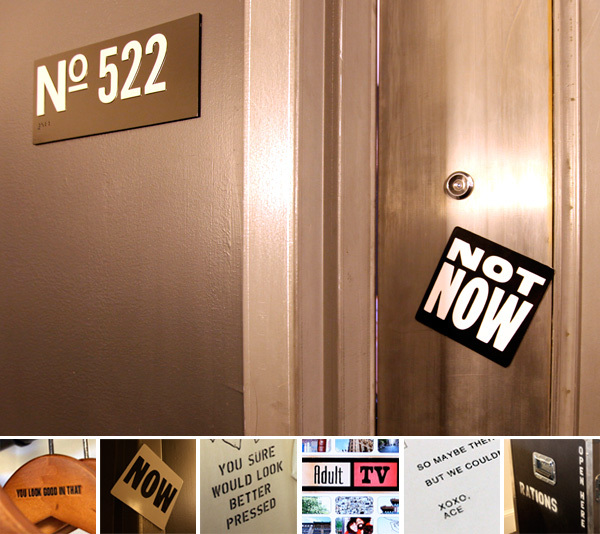 In addition to what you saw of my room last time… here is a focus on the typographic details i’m obsessing on… instead of a smeg fridge i have one of the mini-fridges in a roadie case… and i LOVE the NOW/NOT NOW magnet (yes! the doors are magnetic! )… and this DESK is fabulous. I want one at home, so nice how it overlooks the bed too so i can still look out the window and work here all day long… so go see the pics on the next page already! Latest in designer collabs for Target is Dror. 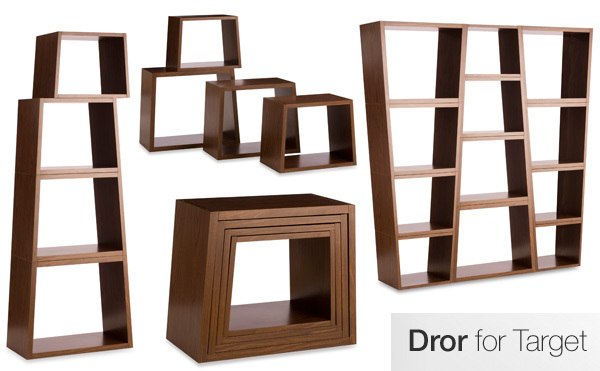 While most of the new collection is more pillows, bedding, little stationery accessories ~ the one piece that really caught my eye are the Nesting/Stacking Bookcase/Shelves! 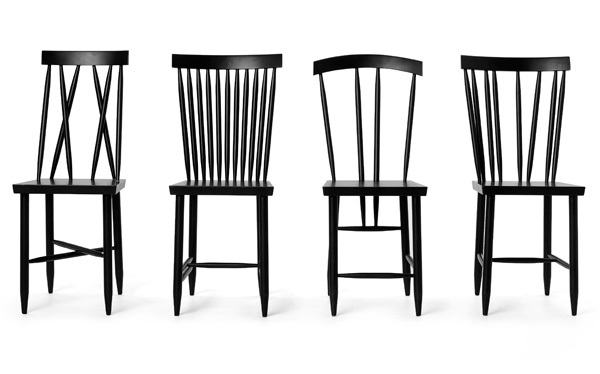 I wonder if they could also be little stools as well? While i’m not sure that i love how they look stacked, i do love that they stack and nest! So multipurpose, and easy to move? Take a peek at some of the larger pics on the next page, and browse the full collection here. The reusable bag trend is a bit out of control. They are pretty much the new t-shirt as far as things to put your graphics on. In concept, i love it ~ less plastic bags, less waste, but then a new problem has cropped up, i think i have an unhealthy amount of reusable bags and tote bags that i love too much to part with, but there is no way i can use that many at one time, even with piles in every house, car, bag, etc… What i HAVE needed lately are throw pillows though (i’m working on figuring out what to do with my empty room, so far stuck an ikea couch/bed and a big desk to play with in there)! And whether you want to call it a new way to reuse cotton tote bags, or recession chic, or multipurpose bag/pillow covers… once the random idea popped up i had to try it! 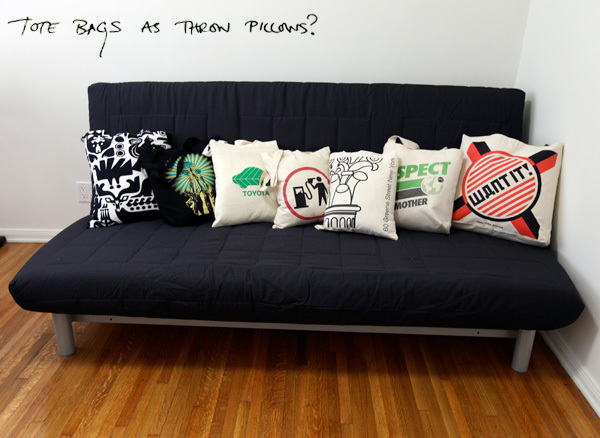 Tote Bags as Throw Pillows! I grabbed a few of my throw pillow inserts that were floating around and some of my favorite tote bags (it’s especially good for those bags you love that are a bit thin material-wise as good functional totes). They don’t look half bad, give me an excuse to SEE some of the graphics i love but tend to end up in a closet, and they are actually really comfy! Now the part i haven’t tackled/resolved yet ~ do i alter the totes? Remove the handles? Or cut the handles and tie them to close the cushion covers? Or add zippers? Or just make custom perfectly sized cushions for them in a light fabric i dont mind having show? That way they can always be swapped back to being used as totes again? Truly multipurpose? Or do a slight stich across the tops to sew them in that can be easily removed when needed? First spotted at the Areaware booth at ICFF, then again at the Designboom Local show ~ how adorable are these nesting “Step Stools” tables by Paul Loebach? The design is so perfectly cute, and the color palette really makes it pop! … in a refreshingly green playful minimal sort of way. “Hard Maple, Birch Plywood - Inspired by the simple versatility of American Shaker furniture, these nesting stools pull out to make a set of steps.” See more images of it from both shows on the next page! 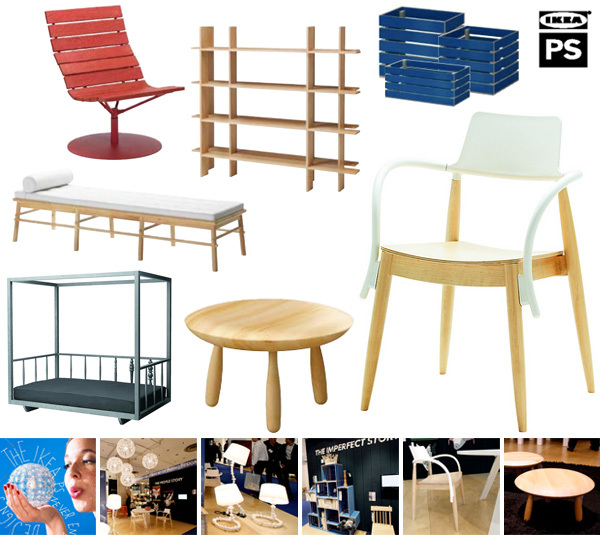 IKEA PS Collection 2009 is stunning ~ those of you following NOTCOT.org may have seen a bit of this collection as it launched in sweden ~ and as the playful animations about the design stories behind the collection began to circulate. While the anticipation for this collection is not yet over (the collection wont be available in the US until August 2009) - but it’s official US launch was at ICFF, so i finally got a chance to check it out in person! This year the theme is “Never Ending Design Stories” - the press release says: “The new collection is all about stories. Stories about our roots, of empowering people, of innovative ways of minimizing the use of resources and maximizing our responsibility for our world.” And the products reflect this beautifully with so many playful, unique, pieces that manage to dance the line between mass produced and full of character. You can see some of my favorites above ~ and on the next page take a peek at pics from the IKEA booth at ICFF 09, as well as the full catalog of products, and a peek at the history of the PS collection. 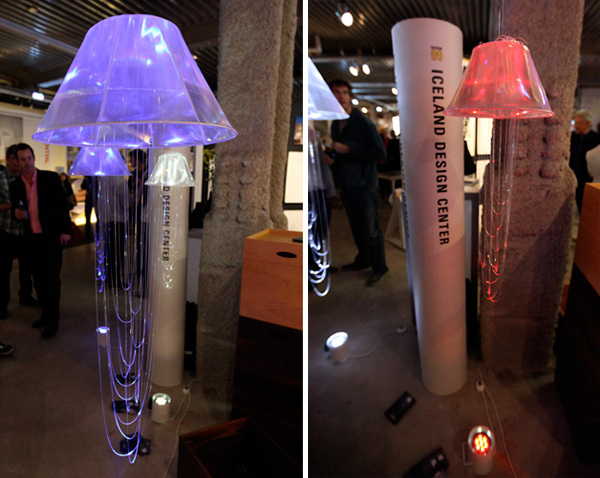 I have to admit this up front because i felt so silly about it ~ when i was trying to start catching up on what ICFF goodness to share, i couldn’t get this insane reflective jellyfish-like icelandic lamps out of my head, so i start photoshopping pictures, and then researching online, only to find that it had already been on NOTCOT.org #20302… So yes, even I can’t keep up with absolutely everything anymore, and truthfully, it was even cooler in person! Now for those who don’t know, these lights are Illuminant by Kristin Birna Bjarnadottir out of Iceland ~ and there is no actual LIGHT in the light! It is like a jellyfish of reflective fabric ~ reflective strands hanging down and bundled above the more classically shaped lamp shade ~ and on the floor is a high powered LED light, simply shooting light up inside of it, and the result is this ethereal glowing free flowing creature… and to change colors, you simple put glass filters on the lights. (Literally just put a glass disc on the top of the light source) Now, imagine a forest of jellyfish in the ocean… can you imagine these installed in an array of sizes and heights hanging from trees in a garden party? Take a look at the various pictures on the next page! i could also totally see these installed in a rave/burning man type situation evolved into a visual/sound installation where the lights pulsate with the music and possibly even push bursts of air upwards to create perfectly timed motion in the tentacles of a forest of these… how fun would that be to watch? I suppose the real question is… How can you pass up seeing DJ Kreemy (Karim) spin and dance all decked out in one of his all pink outfits (down to the watch even!)? There was quite a line for the Artemide party once Karim was spinning, and it was really quite odd trying to explain to this older french couple that may have just happened to wander through Soho at the right moment what it was exactly that people were lined up for… Also hilarious to see more beefy guys in super tight tees, this time green with I <3 LED on them and serving appletinis… The Cadmo lights by Karim were quite beautiful as well, honestly i liked them far better in person than i had in photos that had been circulating. 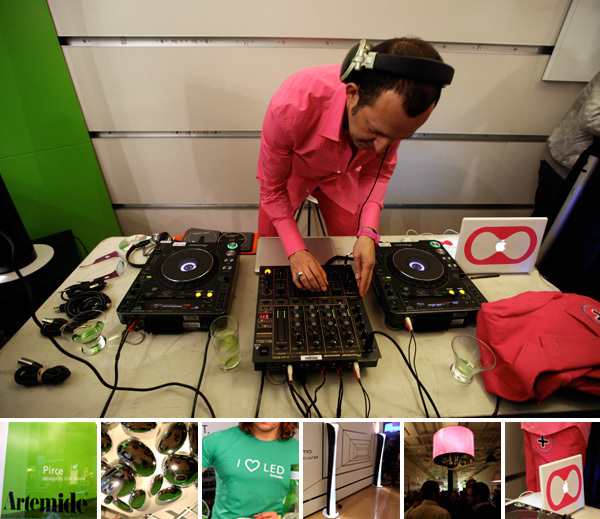 Take a peek at the grassy window display, Karim in action, the lighting, and the I <3 LED bartenders on the next page! 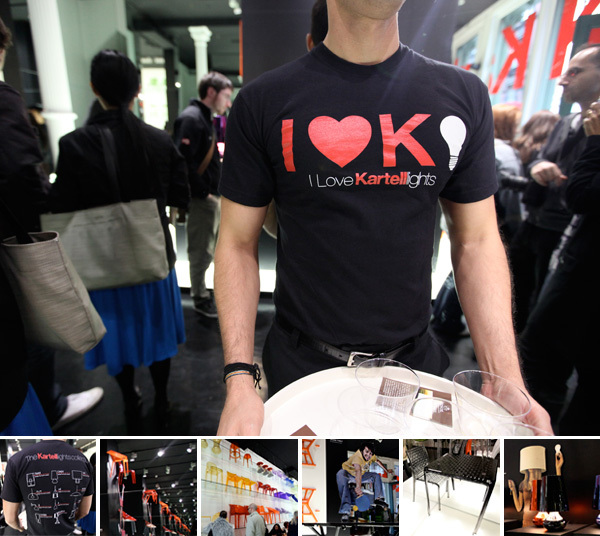 Amazing that Kartell is celebrating their 60th birthday this year! 1949 - 2009! 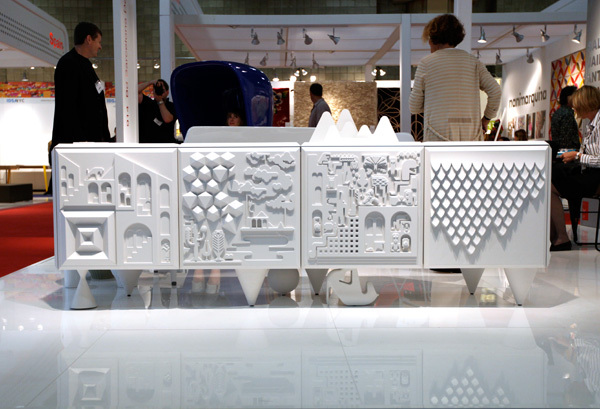 To celebrate their design week party was “Kartell, 60 Years of Design! What a wonderful world!”. Such a classic design powerhouse ~ it was fun not only to see some of their new pieces launched this year, but also their great color sorted displays, playful human cut outs, great use of mirrors, and perhaps my favorite unexpected detail… beefy guys in very tight I <3 Kartell Lights shirts, complete with their lighting collection on their backs. I couldn’t help but as the nice server to pose for me to share his shirt with you! 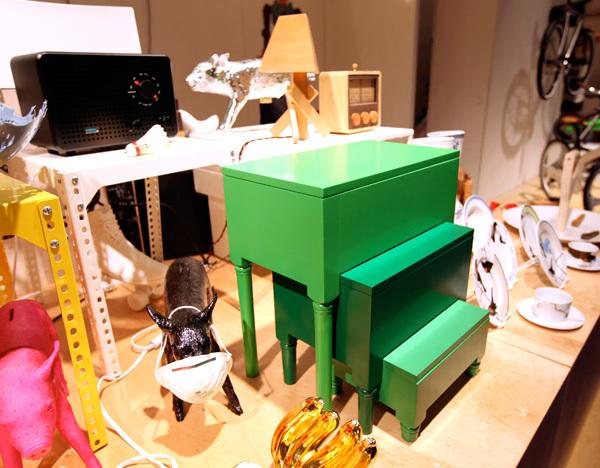 So click on to the next page to take a peek at the Kartell soho show room and the scene tonight! I love the work of Sanna Annukka. I also grew up loving Marimekko before i even knew what it was (i have the very beat up kids stuff to prove it somewhere). 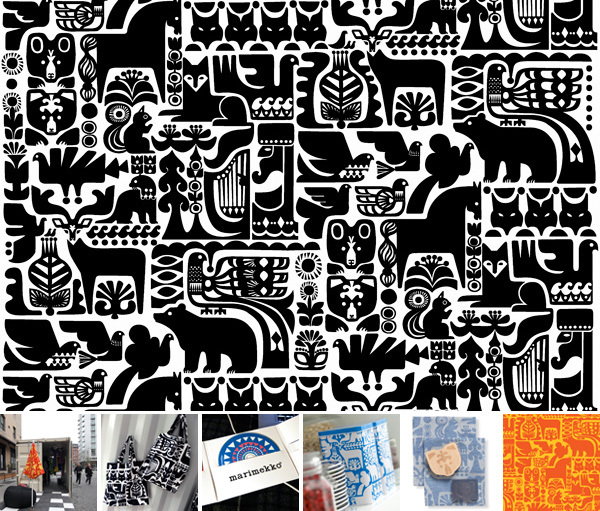 And when Sanna Annukka designed an animal themed print for Marimekko… yes, i pretty much got super excited. And then today… while exploring the meatpacking districts design week happenings and wandering into the Playful New Finnish Design Shipping Container (regulars will already know my fascination with shipping containers for anything other than shipping)… and then getting to see the Sanna Annukka’s Marimekko Kaneleen kutsu pattern in person… and being handed a press kit IN A BLACK AND WHITE TOTE OF THE FABRIC… yea. I was pretty much on cloud 9. I’m totally making that tote into a throw pillow. A throw pillow with handles. That can be hung on the wall when not in use? Sanna Annukka has created for Marimekko a series of expressive designs full of meaning, telling stories from the Finnish national epic, the Kalevala. The Kanteleen kutsu fabric depicts forest animals that have, enchanted, gathered to hear the joyful tunes played on the kantele, a plucked string instrument, by Väinämöinen, the main character of the Kalevala. Väinämöinen, a shamanistic hero, had made his instrument from the jawbone of a giant pike. Mugs, tea towels and other ready-made products feature individual animals ñ birds, squirrels, bears ñ picked from the Kanteleen kutsu fabric. The Sampo, a wealth grinding magic mill with a multi-coloured lid, is featured in the impressive Taikamylly fabric and matching cushion covers, plates and trays. The Ihmemaa art print, sold by the repeat, shows the landscape of Kaleva, the Land of Heroes, and Lake Alue. In the depths of the lake, a whitefish has swallowed fire fallen from the heavens. The series also includes the Onnen helmet duvet cover design, which tells of how Väinämöinen, moved as he played the kantele, cried big tears that flowed into the sea and there changed into pearls. See all the many many pics on the next page! 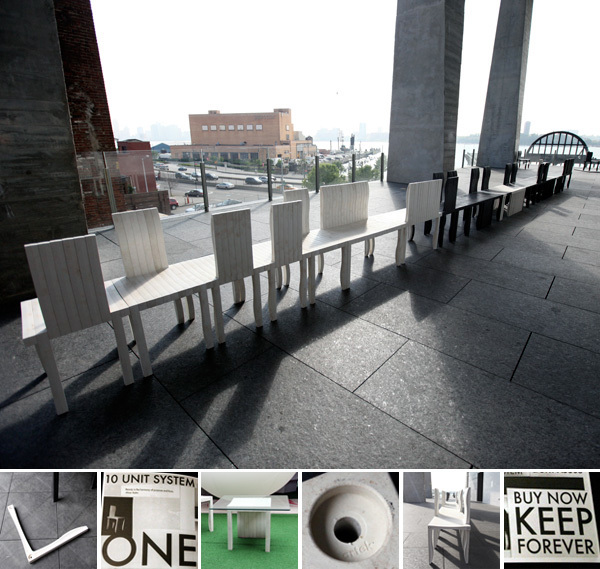 Take a look on the next page for images from the The Standard, New York deck ~ in the Playful New Finnish Design 09 shipping container ~ up close ~ press photos ~ and even the really fun propoganda cut/paste/photocopy zine looking booklet! Check out close ups and press pics on the next page! OH, and i didn’t even get to talking about the 80$ ebay stuffed rabbit they placed on the bright red couch yet. Details like that really draw everyone into a booth… even adorably mesmerized babies (see pic on next page to make sense of this!). 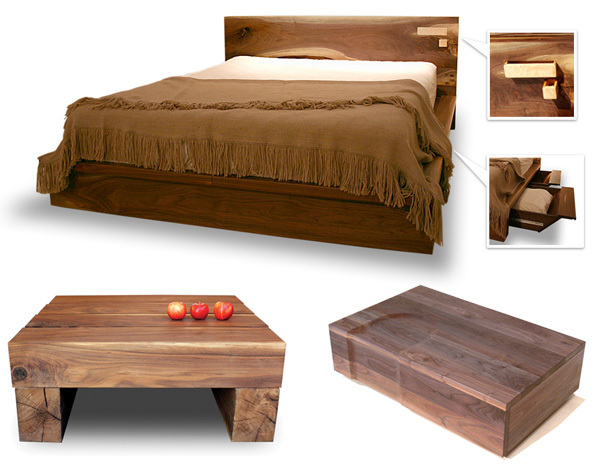 Also the bed, those drawers are slanted! So from afar, you wouldn’t even guess there are 4 large drawers of goodies hidden beneath ~ it just has sleek lines underneath… and then next to your head there are drawers for your glasses and jewelry… but not for your partner/lovers. They even have gorgeous updated variations on what felt like a trunk that evolved into a seat/coffee table that still opens up to provide tons of storage space… and apparently coyotes went from near extinction to overpopulation ~ so they are doing their part by using some of the special culled coyote skins on their cozy chair… and the couch is incredibly comfy/cozy and mounted on gorgeous woodiness… anyhow, see the juxtaposition of press and real world photos on the next page! 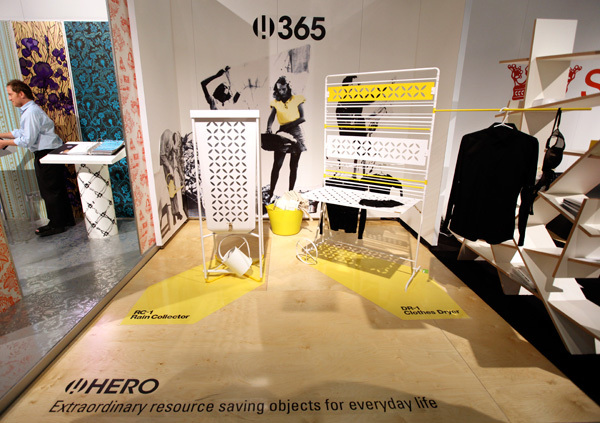 I’m extra giddy about this one ~ my old grad school friends from the Domus/Milan days ~ Jenny Lemieux and Leo Corrales ~ you may remember them as Toronto based Hero Design Lab which did the playful NotConcept series with NOTCOT a while back… have their first series of products Hero 365 showing at ICFF 09!!! Their first two products are the RC-1 Rain Collector and the DR-1 Clothes Dryer. 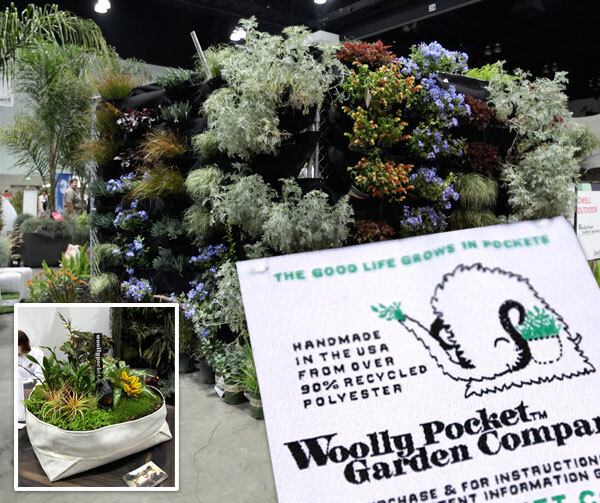 With these “Extraordinary resource saving objects for everyday life” ~ they have taken simple ways to save energy and water, revamped some traditional concept, and made them beautifully functional. Take a look at more pics of these pieces on the next page!